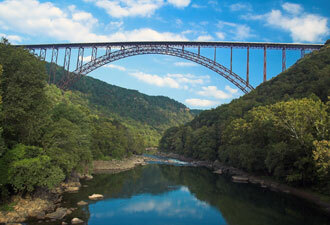 New River Gorge is your destination for high adventure, amazing scenic views, and a glimpse of the nation’s unique cultural history. A rugged, white-water river, flowing northward through deep canyons, the New River is among the oldest rivers on the continent. Located in southern West Virginia, the park encompasses more than 70,000 acres and 53 miles of river for visitors to explore and enjoy. If adventure is what you seek, go whitewater rafting on the New River, climb sandstone cliffs in the gorge, or take a mountain bike ride on forested trails. 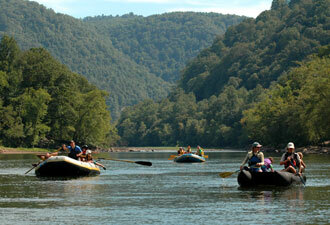 Visitors and families can enjoy great adventures in the gorge, as there are options for every level. The Lower Gorge of the New River is a premier whitewater rafting location with imposing rapids changing in difficulty from Class III to Class V. The Upper Gorge of the New offers a wonderful option for families who want to raft on calmer rapids and enjoy the thrill of whitewater. Commercial outfitters conduct trips from April through October. With more than 1500 established routes ranging in height from 30 to 120 feet, the gorge is one of the most popular climbing areas in the country. The sturdy sandstone cliffs offer challenging routes, most of which are rated 5.9 through 5.13. Novice climbers and families can test their skills at areas such as Bridge Buttress and Junkyard Wall. The climbing season extends from April through November. Rangers at one of the park’s visitor centers can provide information about climbing locations and area climbing companies for both the beginner and skilled climber. The four forest trails of the Arrowhead Trail system include nearly 13 miles of world class stacked-loop mountain bike trails that range in difficulty from easy to moderate. Skilled riders will encounter small obstacles along the trail, rocky sections and tight turns that complement the thrilling flow of the trail. 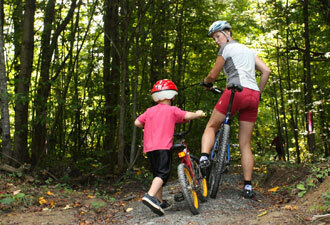 Families with small children can enjoy the easy loops of this trail system, as well as flat rides along the river on the popular Rend Trail. If the area’s scenic views capture your interest, you can choose from among 90 miles of diverse park trails or take a scenic drive along winding mountain roads. At the Grandview, Diamond Point, or Long Point scenic viewpoints, you are observing a globally significant forest containing the most diverse flora of any river gorge in the Appalachian Mountains. The New River sliced through the mountains creating a mosaic of habitats and spectacular scenery. Become a scientist and explore this refuge for endangered mammals, rare birds, and amphibians. You’ll find plenty to satisfy the historian in you. Take a leisurely hike or bike ride and see the remains of the historic Chesapeake and Ohio Railway that opened this rugged and isolated land to the outside world in 1872. Visit the quiet historic town of Thurmond that was one of the busiest locations along the railroad line serving nearly 95,000 passengers a year. Take a drive to the community of Nuttallburg and investigate one of the best intact examples of an old coal mine. This site provides great views of the old coke ovens, the conveyor and tipple system, and the foundations of a church, school, and homes that were part of this thriving community. Plan your visit to New River Gorge National River today and create your own adventure in this rugged and beautiful landscape.